There are many ways to get up to the second deck of the famed Eiffel Tower. One way is to wait in a long line for the official ticket for the elevator. The other way, my preferred way, is to eat at Le Jules Verne (the restaurant has its own private elevator to the second deck). Le Jules Verne restaurant is opened by one of the top French chef, Alan Ducasse. He is the first chef to ever own three 3-Michelin starred restaurants in three different cities! 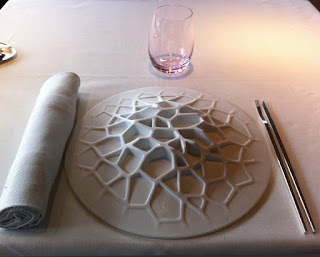 Le Jules Verne currently has one Michelin star. The food here is quite competent. You are not going to get avant garde food here that you will be boasting about it years from now. Instead, you will get beautifully plated food that taste great. The restaurant is divided into two separate rooms. The one closer to the entrance seem to be where they place all the foreigners/ tourists. I assume they do that because the staffs in that room speak English whereas the other room, presumably the staffs' English language skills are not as high. The view there is also excellent. Being this high up inside of the Eiffel Tower means that you will have unparalleled view of the city. It's really quite magical to eat here if you are in the mood for romance. After the excellent dinner, the maitre-d' will ask you if you want to go upstairs to the second deck of the Eiffel Tower. You just have to walk up a small flight of stairs and voila! You are there with everyone else. When you are done, you can go back to the door where you exited and buzz the maitre-d' to let you back in. If you are in Paris for a short romantic trip, I would highly recommend you to eat here because you get a very good meal plus fantastic view of the city in one shot; a very efficient way to take in the city of light. Don't you think?